DOWN Diversity in Action in partnership with the Down Policing and Community Safety Partnership has been encouraged after their highly successful Sharing Cultures event held in Downpatrick’s Great Hall. 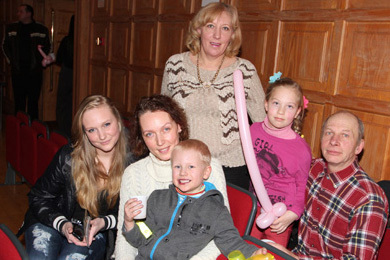 The Petruliac’s and the Tomoseuiciene’s from Lithuania who live in Castlewellan enjoyed their evening at the Down Diversity in Action event in the Great Hall in Downpatrick. A spokesperson said: “The event on Friday 1 February attracted large numbers from all traditions and ethnic minorities who reside or work within the district. Children enjoyed the balloon modelling while adults indulged in tradition international cuisine and singing and dancing in traditional attire. Councilllor Mickey Coogan, Chairperson of Down District Council, who attended the event, said, “The sharing cultures event has shown just how diverse we are in Down District. I met lots of people who reside within the district and have described the pleasant welcoming they have received since coming to County Down to work.